The origin of the Saami nationality on Kola Peninsula. The Saami Nationality has arisen on the territory of Scandinavia and Kola Peninsula in the second and first millennium BC as a result of merge of Finno-Ugric tribes, that arrived here from northern Ural with the tribes from the country between the two rivers, Oka and Wolga, that arrived earlier on Kola Peninsula, somewhere in the beginning of third millennium BC. The ancestors of the modern Saami are called Proto-Lapps. About two and a half millenniums of isolated life were finished at the end of the first millennium of the Common Era, when Russian and Finnish traders began penetrating on Kola Peninsula and Norwegians began to grow roots at the Barents Sea coast. The active and much more aggressive southerners have quickly subordinated the Saami and forced them to render tribute. At the same time, despite of the prevalence of newly arrived nations, the culture and the way of life of the Saami were so unusual and remembered that very soon all the area populated by Saami began to be referred to as Lapland. 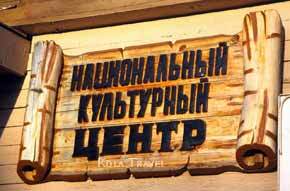 Long time the borders between Swedish, Russian and Norwegian Lapland were determined by tribute collectors. Consequently, the Saami living by the borders were quite often rendering tribute to the two or even to the three kings. To avoid it, the Saami families were aspired to move to the places where the tribute was less burdensome and the family connections was more strong. Increasing artificial isolation of several groups of one nation during several centuries and contacts of the Russian Saami with another reindeer-breeding nation of Komi - Izhemtsy during the last century, have resulted in forming of appreciable distinctions in the Saami costume, traditions and folklore. But main peculiarity of Saami living on the territory of four countries now, remained - they were and have stayed the "Reindeers Nation". The way of living of the most Saami differs very little from the way of living of the neighbouring nations, but Saami families are moving to undercover forest houses, to game-preserves of their grandfathers as soon as the warm time of year comes. They less appreciate all boons of civilizations than the way of life which their ancestors were conducting for centuries and even for millenniums ago. Perhaps, the ancestors of the Saami have achieved much more than we have got used to think. They have achieved a harmony in mutual relations with a nature, which is unattainable for us so far. The nature of the north was giving to the Saami all the blessings that they required in abundance. It was dressing them, feeding and keeping them and the Saami were finding the satisfaction of their spiritual needs in a dialogue with a nature. In the pagan times the Saami idolized the animals and birds, saint stones (seids), trees and soil, but a special place in the Saami folklore was certainly occupied by reindeers, to be more exact - the man - reindeer Myandash. 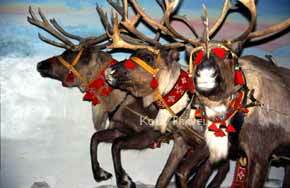 The reindeer Myandash might turn into man by his own wish. The Saami have originated from his marriage with the woman Matryona by one of the legends, by another – all their children became reindeers and have left to tundra after their father. 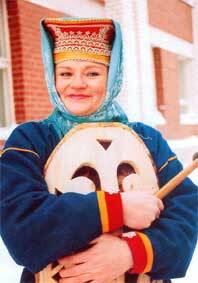 It seems that the national Saami costume has absorbed the bright and pure colours of the Kola North. The love of the Saami to the bright and cheerful colours and ornamental pattern you can notice everywhere - in the trim of clothes, footwear, mittens, handbags and reindeers harnesses. The favourite colours are red and dark blue. Each Saami village differs from the others by its own traditions of decoration of the costumes. Girl from Lovozero village, dressed in traditional costume.